​​​​ AUSTIN – As the Longhorn faithful counted down the clock for first kickoff of the 2017 season, the third quarter 2017 Austin industrial market segment registered another muted quarter of activity. With the delivery of 860,000 sf of new construction in second quarter 2017 with historically high asking rents, tenants have gravitated towards lease renewals rather than moving into new space. Deliveries in 3Q 2017 were light as two Class B products came online in the Far Northeast submarket. However, the construction pipeline remained searing with more than 1.2 million sf currently in development. Vacancy ticked up from 8.8 percent in 2Q 2017 to 9.3 percent in 3Q 2017, while the average annual asking rent declined $0.13 from 2Q 2017 to $10.39 per sf. The industrial market registered 74,252 sf of positive net absorption in 3Q 2017. The flex market segment accounted for 170,393 sf of absorption, while the warehouse segment rescinded by negative 96,141 sf. 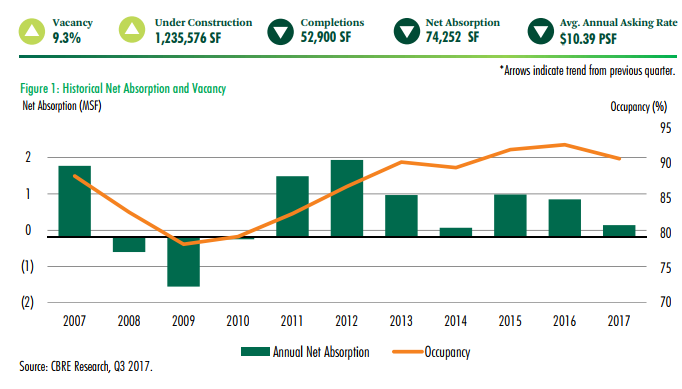 See CBRE Austin Industrial 3Q 2017 Marketview for more. C​heck out a variety of companies' quarterly data under industrial market research for DFW​, Houston​, and San Antonio​.